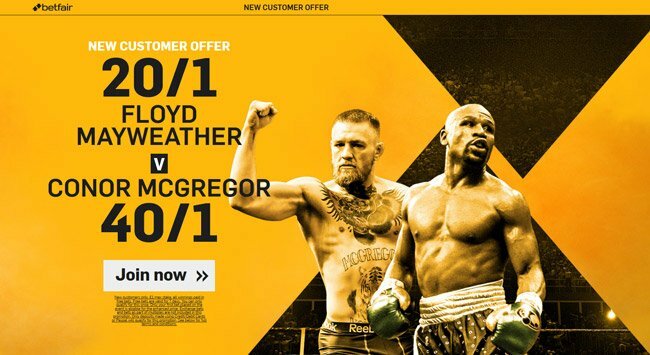 Get 20/1 Mayweather or 40/1 McGregor to win at Betfair! Risk-free! Conor McGregor and Floyd Mayweather go face to face in the richest boxing fight on Saturday 26th August 2017 and bookmaker Betfair are offering the best enhanced odds on the match! Join via our links and claim 20/1 Floyd Mayweather or 40/1 Conor McGregor to win the bout, plus money back if you lose! Conor McGregor and Floyd Mayweather have been involved in a war of words for several months! They finally agreed to fight this summer in Las Vegas and we are sure it will be one of the biggest night ever in boxing history! Are you backing the Irish UFC fighter or the unbeaten champion Mayweather to win the bout? 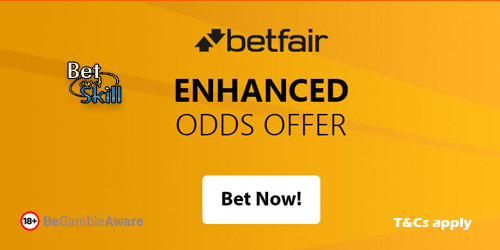 Find here how to get enhanced odds on Floyd Mayweather v Conor McGregor fight at Betfair! Place your first bet (max £/€1) on Floyd Mayweather or Conor McGregor to win the fight! £1. Only the win part of Each Way bets count towards promotion. • Winning Example: Enhanced 20/1 x max £1= £20 paid in FREE BETS plus £1 qualifying stake returned as CASH. For every 5 x £10 single bets you will receive a £20 free bet. More than £10 or more can be staked but will only count as one bet. Max bonus a qualifying customer can receive is £100in free bets. "Get 20/1 Mayweather or 40/1 McGregor to win at Betfair! Risk-free!"